Contents: Rice, soup, salad and melon. Notes: The soup looks awesome. Anyone know what is on/in the salad? I agree about the soup being a "curry" - called "hi-rice" by brand. Very mild and yummy. The salad is probably that typical modern Korean salad - chopped vegetables (maybe cabbage?) usually includes potato & apple with kewpie mayonnaise. VERY sweet. Is that a radiation symbol? 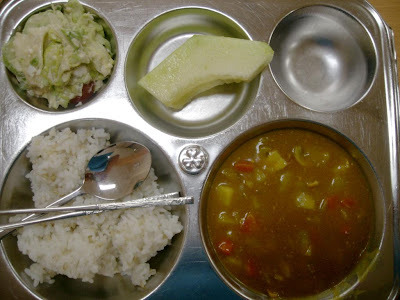 And, I am guessing this is a picture a foreign teacher took of what he or she served him/herself because a) there is too much rice, and b) Where is the kimchi? At my school usually both regular cabbage kimchi and cucumber kimchi (cut into half-coins) are served on curry days. School "salads" are a gooey sogfest of unidentifiable veggies covered with mayo. This one looks like lettuce and cherry tomatoes, and maybe corn. The rice looks to have a bit of barley mixed in, to add a touch of whole grains. I agree with #4 - this definitely isn't a lunch that Korean children eat. Korean students eat at least one kind of kimchi with every meal. The soup is likely barley vegetable, not curry. Definitely broth-based. Korean cafeteria meals are usually around 500-600 calories for lunch. 3. the fruit seems an apple to me..
4. they serve every meal with kimchi, but you can choose not to eat.I guess the empty one is left for kimchl. It is definitely Korean's school lunch. I spent 9 years in Korean school. it is true that Kimchi is kinda compulsory for every school meal. But the upper right bowl is empty. I'm sure the person who had this meal doesn't like kimchi or forgot to take kimchi. Normally their food tray is filled with 3 different kinds of side dishes. And, that soup is definitely curry. that seems a little bit thin but that is not very surprising for public school lunch. That unidentified fruit is melon.